I’m back with another chapter of Danganronpa V3: Killing Harmony completed. Unlike the last chapter, this one went very well, in that I managed to figure out almost everything prior to the actual class trial. That said, I felt like this chapter was a bit more boring than the previous ones. The mystery this time around didn’t excite me as much, part of this might be because many things seemed fairly obvious to me early on and I formed many conclusions quickly, even prior to the murder I had many ideas. Still fun, the mystery part just wasn’t as fun as previous chapters. I mentioned recently that even though it didn’t receive many likes (understandable, this is an anime blog), my other Hearts of Iron IV post gets a lot of hits from Google. If this isn’t your kind of post, no worries. And I also recently had an excellent game as Bulgaria, so I wanted to showcase the magic here. I’m thinking about recording these and maybe making videos of my playthroughs accompanied by a written post of what happened here. We’ll see though, not sure how demanding it is to record while playing, because the game really slows down after 5+ in-game years. The game is Hearts of Iron IV. This game is using the Kaiserreich mod. And finally I’m using the Moereich / Kaiserreich Anime mod, to add anime portraits to the game, because why not? Also I’ve made it so you can click the images so you can get see the maps better. So I’ve found the time to finish chapter 3, and it was quite the mystery, I’ll admit. I’ll also admit I didn’t do so well! After the first two chapters, the game managed to throw me off quite a bit with this one. I’ve decided to stop writing so much synopsis / summary in these posts, because they don’t do the game justice and just draw the post out. If you haven’t played the game or seen how it plays out, my synopsis probably isn’t going to help out much in the end anyways. Going to try and focus more on what my thoughts were as I played through. Still ended up writing a lot haha. I feel like this post is more interesting though, with all of my theories and concerns moving forward in the game as to what will happen! A lot has happened this chapter! If chapter 1 was the game signalling to me that I knew what was going on, chapter 2 was the game’s way of knocking me back down. Lot of interesting events occurred in this chapter, so I’m just going to get into it. Danganronpa V3 Chapter 2 Spoilers Ahead! I’ve started playing Danganronpa V3: Killing Harmony! I actually noticed it on Steam thanks to Doki Doki, and saw that it was 50% off. I’ve played both Danganronpa 1 and 2, as well as watched the anime, but I sort of forgot that there was a new game that I hadn’t yet played. The moment I loaded up the game and heard the signature Danganronpa theme, I was hit with a wave of nostalgia and excitement! Yomu is back with another anime game. But it’s not actually an anime game, just a game with an anime mod. The game is Hearts of Iron IV, a WW2 grand strategy game that I have sunk many hours into. Only I don’t play the unmodded, original game. I play using the Kaiserreich mod, which is an overhaul of the game that puts the world into an alternate timeline where Germany won WW1. (Here is a link of the alternate history timeline, if you are interested. It’s a very in depth undertaking, with a lot of detail and thought put into it). And the Kaiserreich mod just happens to have an anime mod, that changes the portraits for all of the nation leaders and generals to anime girls, as well as some background images. What could be better than that? 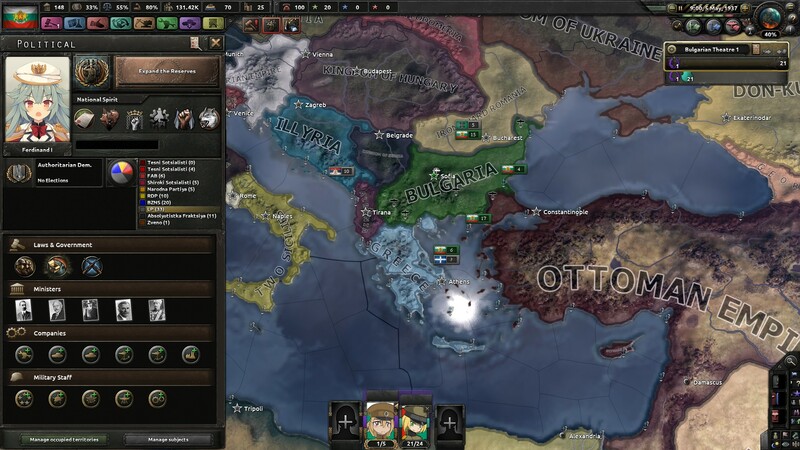 Edit – While I never ended up finishing this game, I do have a more recent successful game played as Bulgaria that you can find here. Anime Strategy Game? Count Me In! Recently I stumbled upon a fun and cheap anime strategy game on Steam. I’m a big fan of strategy games – both the Total War franchise and Paradox grand strategy games are some of my absolute favourites. Knowing this, Steam recommended a highly rated strategy game to me that just happens to be anime inspired: Lost Technology. Also the game was on sale, 20% off; which is pretty crazy because the game is normally $5.69 (Cdn). So I really only saved a dollar thanks to the sale! And it’s turned out to be a really fun game! For basically 5 bucks! What can I say, I’ve got an eye for deals. Confessions of an anime blog. This is where I share what I watch, play and love. All things anime, seiyuu's and more!